Most nights I love cooking and don't mind using numerous pots and pans. Some nights I just want a quick, healthy, no big mess dinner. 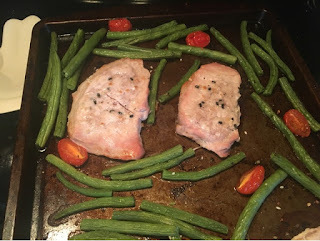 I saw this One Pan Pork Chip Dinner recipe on Pinterest and decided to give it a try, but tweak it to my wanting. I recently just bought Trader Joes Everything Bagel Seasoning, and I really have been trying it on everything. 1- Preheat oven to 425 degrees. Spray baking sheet with cooking spray or EVOO. 2- Cut ends off green beans, and slice cherry tomato in half. Place on baking sheet. Lightly spray with EVOO and sprinkle with salt. 3- Sprinkle both sides of pork chops with desire amount of Everything Bagel Seasoning. 4- Bake for 25-30 minutes.